Carpet Cleaning Dripping Springs, TX – Don’t let dirt build up under the surface of your carpet. Schedule professional carpet cleaning from Capital of Texas Chem-Dry to eliminate embedded bacteria and soils and preserve the quality and comfort of your carpet. Proudly serving Dripping Springs, TX. Deeper dirt can do a lot of damage to a carpet pad and the resiliency of carpet fibers. If too much dirt accumulates under the surface it leads to permanent wear and discoloration on the surface. You cannot remove this type of dirt with a vacuum or basic cleaning methods. This is why you need to hire Alhambra carpet cleaners each year. Local companies in Dripping Springs have the powerful equipment, industry experience and trained staff able to extract embedded dirt and restore the quality and color of the carpet in your home. You just need to hire the right carpet cleaner for the job! Be careful of services that advertise steam cleaning or prices too good to be true. The lower the price, the lower the quality. The reason you should be cautious of steam cleaning is because it requires so much water. You never want to expose your carpet to excessive amounts of water if you don’t have to. The good news is you don’t have to! Capital of Texas Chem-Dry uses one-fifth the amount of water steam cleaners in Dripping Springs use. This is because we don’t use soap for our clean results so we don’t need all the water necessary to rinse soap from carpet. Our process is healthier too! 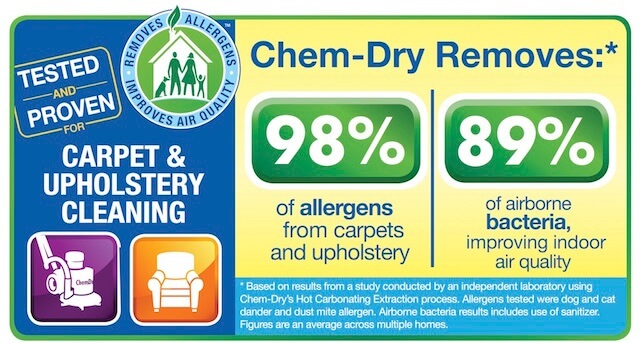 The service features no chemicals and removes over 98% of allergens from carpet. Our process begins with an inspection and consultation. Then we vacuum to remove loose dirt and debris before we spray The Natural® onto your carpet. The Natural® is revolutionary in that it is 100% green and contains no soap or detergent. The solution produces millions of microscopic bubbles so powerful they can pull deep dirt to the surface of your carpet. With the dirt on the surface, we can remove it using our Hot Carbonating Extraction (HCE) cleaning method. HCE uses powerful suction to remove the dirt, bacteria, allergens and remaining traces of The Natural® from your carpet. The system is approved and recommended by carpet manufacturers and has received The Carpet & Rug Institute Seal of Approval. The process is efficient, effective and healthy for your home. Our drier method leads to carpets that are dry in just 1-2 hours after the appointment. Contact us to get a free quote and request a service appointment. We'll discuss your needs, provide you with a no-obligation quote and can begin the cleaning process at your convenience. 512-892-1116! Serving Austin and Dripping Springs, TX!